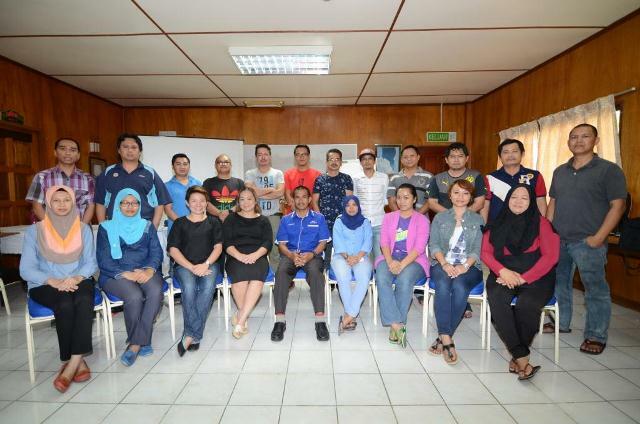 TUESDAY, 23 FEBRUARY – The Neuro-Linguistic Programming (NLP) organised by the Faculty of Humanities, Arts and Heritage (FKSW) Universiti Malaysia Sabah (UMS) was able to motivate and generate new ideas to staff in aspects of communication style, thus helping the organisation’s management effectively. The course, which focuses on patterns of human representation system as well as nine patterns of thinking can affect the process of self-development and career excellence. Head of Administration at FKSW, Masri Judah when delivering his lecture during the course said the emphasis on thinking pattern was important for improvement or changes in the job. “Today’s organisation need individuals who are always enthusiastic, focused and positive to ensure that the organisation is able to compete at international level. “In this case, the attitude of not being able to accept criticism or comments from others should be eradicated as contribution of ideas is not limited to our own work scope only but expanded for the benefit of the organisation,” he said. Meanwhile, the Deputy Dean of Academic and International of FKSW, Associate Professor Dr. Gusni Saat urged all staff to be more concerned of their surroundings, be it in doing their part, towards building and the hygiene throughout their working lives at the office or the campus. He said, it was a challenge for the staff to give their best including caring for the university’s facilities so that the agenda of producing successful human capital continued to do well.